Troy and The Trojan War. I am sure most of you know the story of Troy. Because of the historian Homer and his poetic writing, the war between King Priam and the Achaeans is a story that has existed down to our era. Situated on the shores of the Dardanelles (in that era), strategically, Troy grasped control of the trade route into the Black Sea. The ruins of Troy are well posted and the walls of Troy I, II, and VI can be clearly observable. 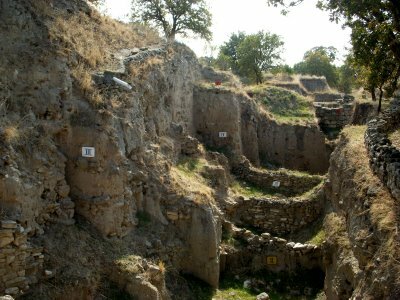 Troy I dates back to 3000 to 2500 BCE, only a small area within the walls existed during that time, although with great detail built in a herringbone pattern. 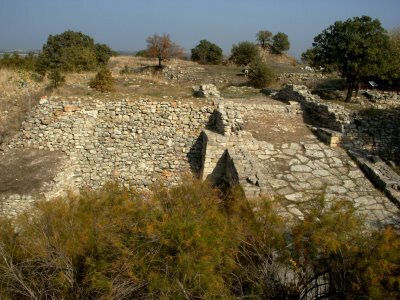 Troy II and III dates back to 2500 – 2200 BCE that consists of seven layers built on top of one another. 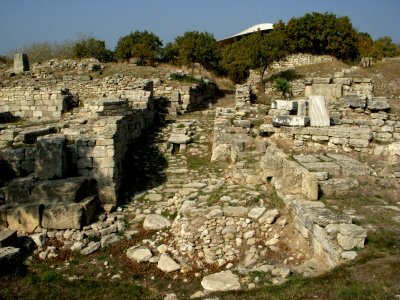 The city was expanded compared to Troy I, the walls of Troy II is clearly identifiable along with this ramp (below picture). The above picture is a model of Troy II, this ramp in the below picture is the steep ramp to the left. The very top picture is of Troy VI and VII during the Trojan War, along with the different layers from Troy I through IX. The above picture displays the different levels of Troy. Troy VI and VII expanded the walls even further, and it is most likely Troy VII was during the Trojan War. Traces of a huge fire are found during this period, and the walls of Troy were fortified at this time. 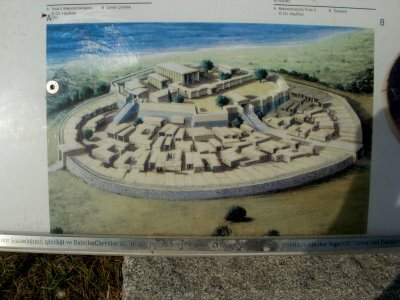 The walls and size of the city could be identified, along with the south gate and the road that went to the upper castle in the picture below. Troy IX was built during the Roman period. 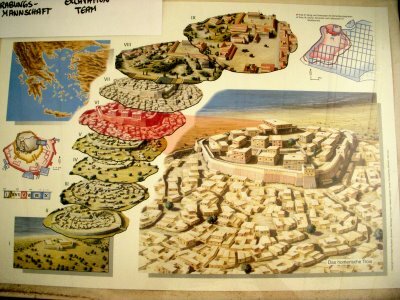 The is the road to your right on the picture model of Troy II, and the strong fortified south tower and gate of Troy VI – VII. The Trojan war was set off because of Paris, the son of King Priam of Troy. Paris was asked by Zeus to be the judge of the first beauty contest and Aphrodite, Athena, and Hera were the contestants. Paris choose Aphrodite and traveled to see Helen the fairest woman in the world at Sparta. Helen was the wife of Menelaus—Paris upon seeing Helen feel in love and her with him and they eloped for Troy. Menelaus, assuming Helen had been abducted by Paris, set off for Troy with hundreds of war ships, and this was the cause of the Trojan war. The heros of the story are Achilles with his strong heel (Achilles heel) on the side of Menelaus. Hector, the son of Priam was the mighty successful warrior, and because of Hector and the strong walls of Troy the war lasted nine years. Odysseus on the side of Menelaus, crafted a clever strategy. 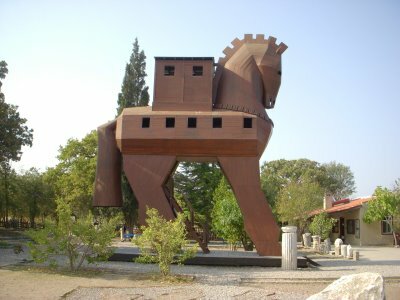 The impression that the Achaeans were giving up and leaving, although leaving behind a wooden horse as a gift, the Trojans excepted the gift and brought the horse into the city. During the night, the soldiers that were hidden in the horse, sunk out and killed the Trojans, looted, and burned the city. The story of Odysseus continues after the burning of Troy, because of his ego related speech, Poseidon puts a curse on Odysseus that puts him on a challenging journey striving to reach his beloved Penelope. The movie “The Odyssey” portrays the story of Odysseus striving to reach his Penelope—exciting stuff. Next post: Arrived in Istanbul. Previous post: The Island of Bozcaada.